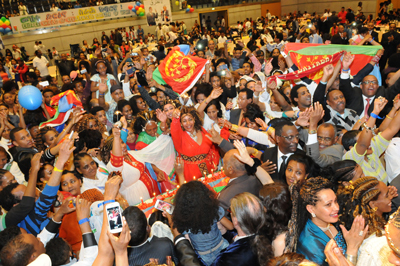 In the celebrations they conducted in connection with 22nd Independence Day, Eritrean community members in Switzerland expressed resolve to live up to expectations to participate in the success of the national development programs in the Homeland. The event was aimed at reinforcing strong ties of nationals with their Government and people, popularizing national values among the young generation, reflecting the true image of their country as well as expressing resolve to back up national development programs and conduct staunch resistance against external conspiracies. Speaking on the occasion, Mr. Bereket Woldeyohannes, Head of the office of the Eritrean Embassy in Switzerland, indicated that the Eritrean people have paid heavy sacrifice to bring independence and safeguarding sovereignty, and that to date they are heavily engaged in efforts to see developed and investment center Eritrea. He further noted that specialty of the event rests on the fact that it is being celebrated at a time when anti-Eritrea agendas have ended up in utter failure and that the economic development achieved in the past 22 years of independence are vivid indicators for the bright future of the country. He further called on the community members to continue mounting staunch resistance against enemy conspiracies. The cultural troupe from Eritrea added color to the celebrations.